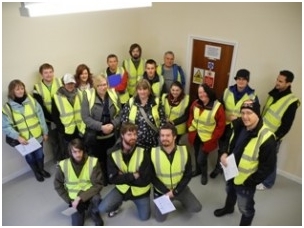 22 BSc Environmental Resource Management students and staff from Cornwall College gained an insight into the past, present and future of Wheal Jane and enjoyed a tour of the Water Treatment Plant and other projects taking place on the site this week. Over 250 students have visited the site over the past 2 years from Cornwall College, Exeter University, Camborne School of Mines, Truro and Penwith College and Falmouth Marine School. Most groups have now become regular annual visitors to Wheal Jane. The site and ongoing plans and projects based here provide a valuable insight for students studying a wide variety of subjects including environmental science, forensic science, renewable energy and post mining remediation. We look forward to welcoming for their first visit to Wheal Jane Environmental Science and Human Health students from Exeter University Medical School early in 2013.